This is the ProTek R/C "Prodigy 610 QUAD AC" LiHV/LiPo/LiFe/NiMH AC/DC Battery Charger. 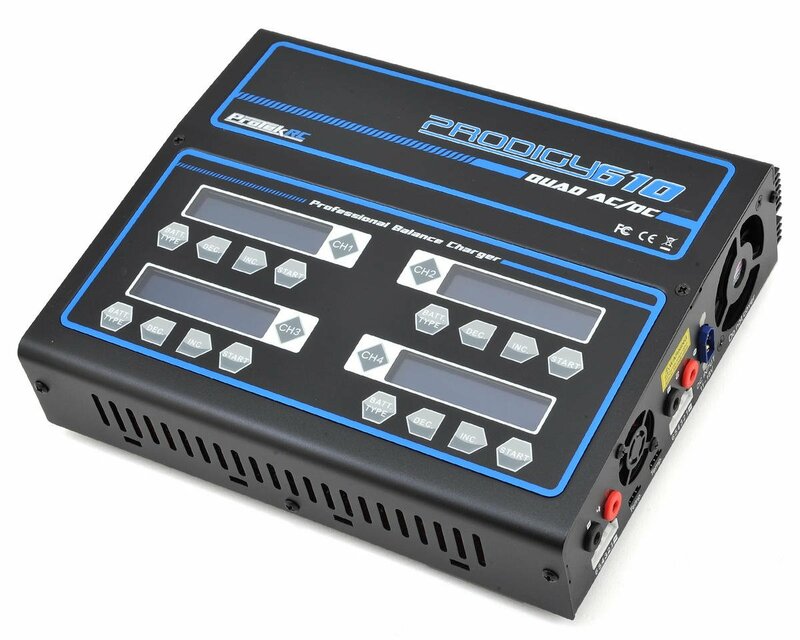 A quad port AC/DC charger that can handle 6S packs, is capable of 10 amp charge rates, worldwide 110V/220V voltage versatility, with 100 Watts of power per side...the next generation of Prodigy has arrived. Backed by ProTek R/C's revolutionary customer support, the Prodigy 610 QUAD AC delivers the power you need to get your batteries charged fast and eliminates the need for an external power supply! The Prodigy 610 QUAD AC delivers a variety of powerful, yet useful features. The Digital Power setting allows users to power additional DC powered equipment, while the Pre-Charge function gives users an opportunity to save Lithium batteries that have been discharged too far. Additionally, compatibility with all common battery types means the Prodigy 610 QUAD AC is an all in one solution for your battery management needs. These features only scratch the surface of what the Prodigy 610 QUAD AC delivers. Pick one up and see for yourself why Protek R/C is found on the benches of some of the most respected R/C professionals in the world, including racer Atsushi Hara, pilot Tim Jones and more. The next generation has arrived. Don't get left behind. NOTE: To determine if this charger is suitable for your application, you must perform this calculation to determine the maximum amp rate the charger can supply. Divide the Watts of the charger by the Voltage of the battery pack. This will tell you the maximum amp rate the charger can deliver (Watts / Voltage = Amps). So using the 612 QUAD AC as an example and a 6S LiPo battery pack, would be 100 Watts divided by 22.2 Volts, which equals 4.5 Amps. This means that the charger can supply a maximum of 4.5 amps to a 22.2 Volt 6S battery. This amp rate will gradually reduce as the battery voltage increases during the charge cycle. NOTE: Included power cord is only compatible with Type B 110V outlets. 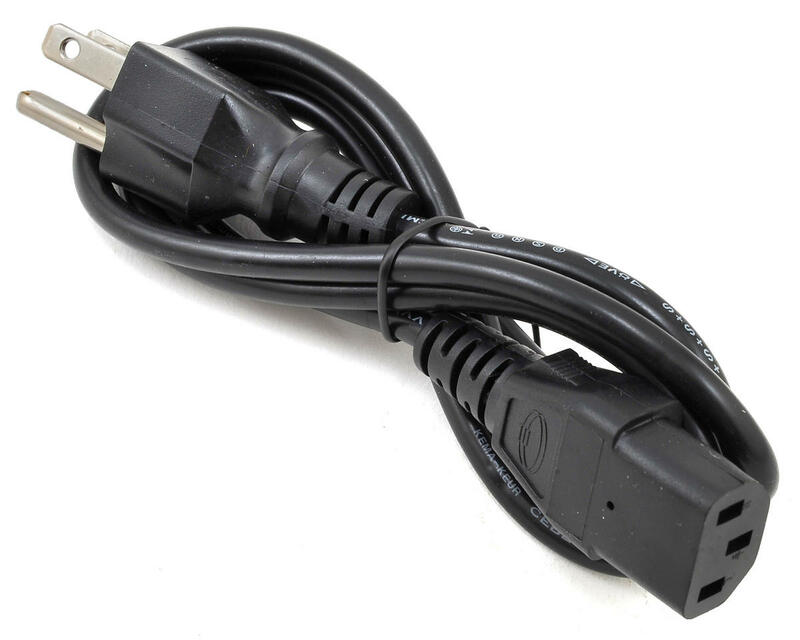 "Type E/F" (PTK-5316), "Type G" (PTK-5317), and "Type I" (PTK-5318) power cords are available and must be purchased separately. This charger works great. Does a good job balance and storage charging which is mostly all I care about. Having the built in power supply is great so I can run it at home without an external supply or at the track off of a 12v battery. I 1have used it to charge my 4S batteries at 6.5A which is not bad, would have liked 150w per channel instead but it's still pretty good. Having 4 channels to work with is great because I never have to wait for a battery to finish before starting the next. Also great for storage charging at the end of the day. - DO NOT LEAVE DC (battery) LEADS CONNECTED TO CHARGER WHEN USING 110V AC POWER, despite there being no mention of this in the manual the DC input port provides the full output of the AC power supply when active, if you accidentally short the DC input leads it will blow the AC power supply (if the alligator clips touch for example). This will result in only being able to power the charger via the DC input as your AC power supply will be dead. 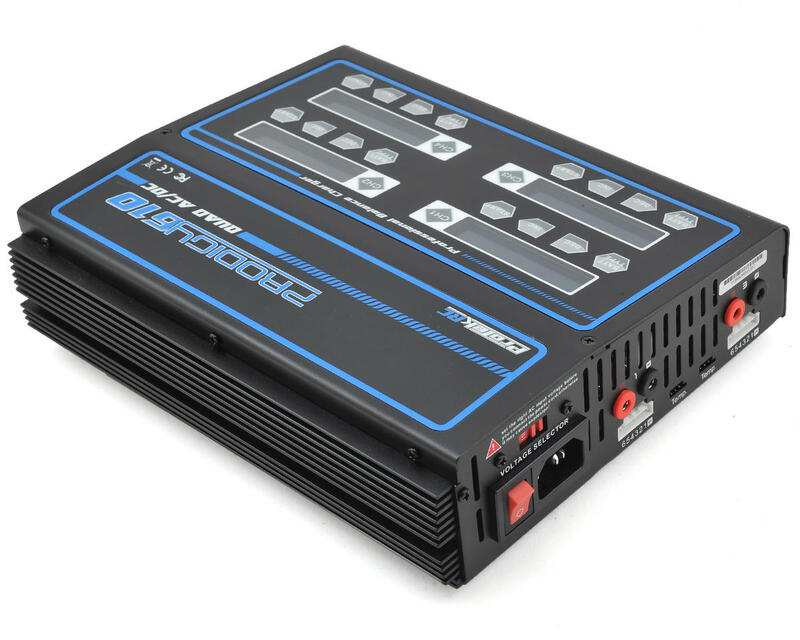 - DC input maximum is 18v so when at the track you can't run it off of 2 deep cycle batteries in series, would have been nice to set it up to handle 24v input. Aside from the manual missing the obvious warning regarding the ability to smoke your AC power supply by shorting the DC inputs when the AC power supply is in use I think this is a great charger. I would definitely recommend it. I would have given it 5 stars if the manual included the warning, or better yet if they had integrated a breaker to prevent this from being possible. Excellent charger, my second. Plenty of power and it charges fast and all kinds of batteries including Hi-Voltage LiHV. It includes a wide variety of cable and adapters. Easy to use and there is a separate screen and set of controls for each port plus an On/Off switch. Great customer service and support including a one year warranty. This is the best charger I have ever used, ease of use and versatile. A few problems you should know, out of the box you can't charge anything. It doesn't come with any actual useable charge leads, you will need to buy them extra. I thought this funny for such an expensive charger and an extra 2$ wouldn't have killed them but oh well. Putting the lack of hardware aside it gives me more than enough power to run my dual para boards and have power to spare. Fielding a family of racers and only having a single 4 amp charger mad for very stressful nights at the track. That all ended when I bought this charger. Best decision ever! my life has gotten much easier and not only am i able to keep up with my families needs at the track on race night I can also charge batteries for others. I didn't go wrong buying this charger and you wont either. 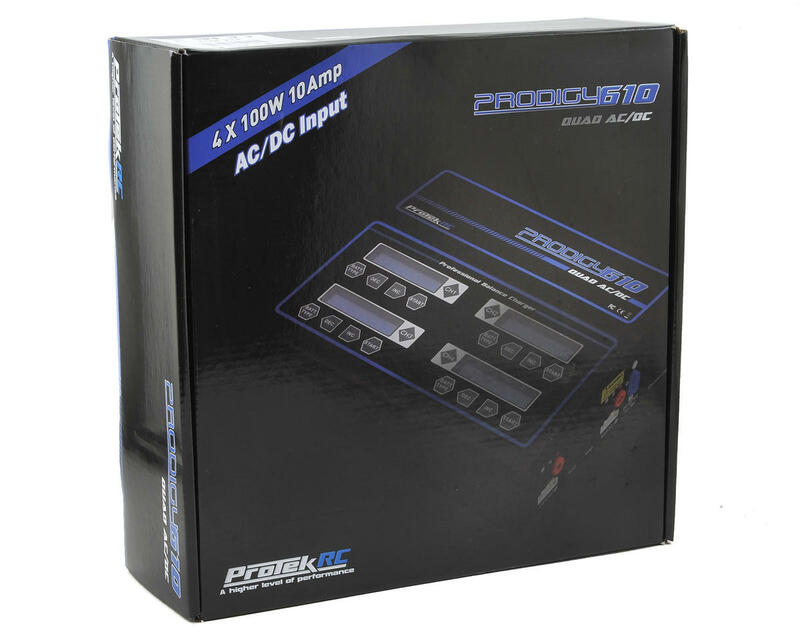 I absolutely love this Quad charger from Protek-the Prodigy 610 Quad AC LIHV/LIPO AC/DC Charger(PTK-8517). It is precise, and takes up less space when I was using two duo chargers previously. I use it primarily on DC and charge 4 batteries at a time, since I usually run two classes on race day (2WD Mod or stock and 4wd 13.5) and of different MAH capacities(3800 LCG shorty packs on 2wd Mod/Stock and 4600 Shorty packs on 13.5 4WD) After use I put them on storage charge. This has been so far a very trustworthy charger and would recommend it to anyone. Very nice that allows you to charge 4 different batteries at the same time. Also have include internal power supply. It would be better if could do more power per channel, like 200 Wats. Also the ability of combine the power of 2 channels. Great features at a reasonable price. The charger includes a nice selection of charging leads and enough balance boards for all of the channels (many 4 channel chargers in this price range only include 1 or 2 balance boards). Menus are easy to navigate to quickly set up channels for different battery chemistries and charging modes. The battery check and polarity alarms are great safety features. On race days I charge 4 batteries at once for myself and my sons and have never been disappointed with the speed and consistency of balance charging. Does a great job discharging to storage voltage. DC power is a nice option but the AC input has never disappointed. I've used this charger for racing and casual RC for close to a year and haven't encountered a single problem. Great charger, love how I can charge 4 different batteries at once, fan is decently quiet, works well. Works well so far. It was an upgrade to my previous charger and much faster. Runs a bit noisy due to the fan I believe but I don’t mind because I know my fan is working and the charger runs very cool, again compared to my last charger. Makes life easier so worth it to me. This is a great charger so far. I've had it for about 3 weeks. I have LIPO,LIHV,NIMH batteries and it does it all. I like the fact that it can do storage charging for when your LIPOs are not going to be used for awhile. 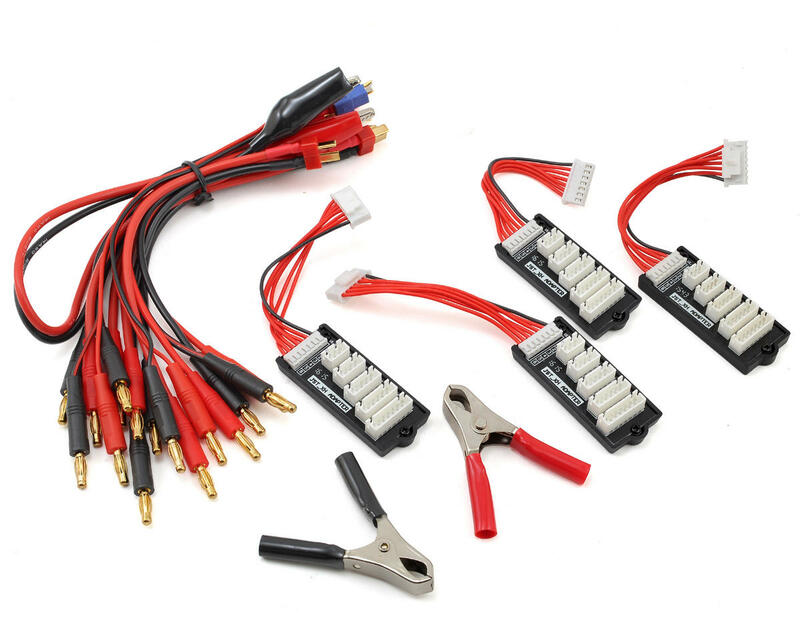 I like that it comes with all Deans plugs which saved me a bunch of time having to solder. The only issue I found was that one of the negative sockets for one of the charging ports had some kind of metal in it which prevents the negative side of the charging wire from going in all the way. So there would be about 1cm of bare metal exposed and sometimes the plug would fall out. Owned for two months; the charger is great. I haven't taken it into the field yet for abuse but it seems very durable. Everything connects very neatly and securely. Very easy to use. I charge 3 2s LiHVs and a 3s. At first I thought the manual was a bit weak but it turns out to be very very easy to use and the memory settings make it easy to setup different battery applications. Would have liked automatic charge and discharge cycling for breaking in LiPO. It offers this on NiMH only. Oh well, a feature I would only seldom use. That's my only gripe this far. This will likely be a great lifelong charger. Great charger! Works great and has no problem charging 4 3s packs at a time at 5amps! Very nice, powerful and easy to use charger with a lot of possibilities ! However I am a little bit disappointed as I have received this charger with 1 “push bouton” not working (the N’1) ! Absolutely love it! Nothing like being able to charge 4 batteries at a time. Been using it for the past 5 months or so. Charging 4s and 2s lipo and 2s li-fe. I'm pleased with the charging times, sometimes balancing takes some time to end. Discharge or storge can take a long time (low discharge current). The charge came with a lot of cables and also support 110V and 220V input voltage. And it's not to heavy so I'm taking it with me to the track. All and all a very good charger with a lot of option and I will recommend it to the more than average user who wants a quality AC charger. Iv'e been in the hobby for 25+ years, Iv'e never had a better charger than this.